France, officially named the French Republic, is the largest country in Western Europe and the third largest in Europe as a whole. It stretches from the Rhine River in the east to the Atlantic Ocean in the west, and from the Mediterranean Sea in the south to the English Channel and North Sea in the north. It is an international cultural, economic and political power and a key player in the European Union. France’s history stretches back into pre-history, with the first signs of human presence 1,800,000 years ago. Its history has been somewhat tumultuous, from being divided and re-divided into kingdoms during the middle ages, to the French Revolution, Napoleon, the Franco-Prussian War and to the World Wars. As a country it offers a rich and varied landscape and is full of fascinating cities, beautiful beaches and relaxing countryside. Famed for its cheese and its wine, France is perfect for a quick getaway or an extended holiday with friends or family. 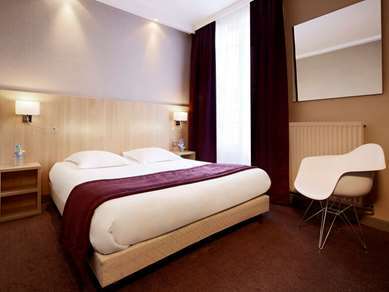 With two days you can enjoy a city break in Paris, staying at the Kyriad Hotel Montmartre. Once there, visit the world famous Louvre to see the Mona Lisa and Venus de Milo. Make time to see the Eiffel Tower and take a stroll along the Champs-Elysees. Otherwise you can take a relaxing rural getaway in the Auvergne region with Kyriad Hotel Clermont Ferrand Centre as your base for exploring the idyllic countryside. Either way you will have two days of typically French experiences. Enjoy seven days exploring the south of France with Kyriad Hotels in Cannes, Nice or Marseille. The Kyriad Hotel Cannes Centre is only a short walk from the famous La Croisette shopping street, while the Kyriad Hotel Marseille Rabatau is perfect to visit the Basilique de Notre Dame de la Garde and its stunning views. In the north of France spend some time in the Picardie region and explore the battlefields of the Somme . DisneyLand Paris makes for an ideal family holiday in France, and the Kyriad Hotel DisneyLand means that you will be ideally placed for your holiday. Or stay at the Kyriad Hotel Poitiers Sud and enjoy a visit to Futuroscope for a brilliant family day out. The south of France is full of beaches that make for brilliant family beach holidays, and the wealth of Kyriad hotels in the area means you’ll never have to travel far. Alternatively if skiing is your thing, then take the kids to the Alps for some great time on the slopes. France is served by a network of rail lines run by SNCF, which will get you to all the major cities. SNCF also operates the TGV line, France’s high-speed train service that will take you up and down the length of the country at top speed. Regional bus services will get you around villages. Several cities, including Paris, Lyon and Marseille, have a metro system. France is famous for its wine and cheese, of which there are man variations, which have been exported around the world. There are different specialities depending on the regions you’re in, but expect great food that is rich and tasty and depends on the local produce for its flavours. In the summer months, particularly in July, France is full of festivals and events. It is an especially good time to sample the country’s jazz festivals which take place all over the country and are a chance to catch some of the biggest names in the business. From the end of June and through July the Tour de France also takes place. Although George Orwell names the manipulative leader Napoleon in his book Animal Farm, it is actually illegal to name a pig Napoleon in France. The French King Charles VIII had six toes on one of his feet and for this reason he promoted squared toed shoes as a way of hiding this.